To Cite: Houshmandpour M, Mahmoodi Z, Lotfi R, Tehranizadeh M, Kabir K. The Effect of Midwife-Oriented Group Counseling, Based on Orem’s Model on Self-Care and Empowerment, in Primiparous Women: A Clinical Trial, Shiraz E-Med J. Online ahead of Print ; 20(3):e70685. doi: 10.5812/semj.70685. Background: Pregnancy is one of the most important and sensitive stages in a woman’s life. Objectives: The present study was conducted to investigate the effect of midwife-oriented group counseling, based on Orem’s model on self-care and empowerment, in primiparous women presenting to select health centers. Methods: The present parallel randomized controlled trial was conducted on 74 pregnant women presenting to select health centers in Talesh, Iran, in 2017. The eligible candidates were selected using convenience sampling and were then divided into an intervention (37) as well as a control group (37) in randomized blocks of four. The participants completed the pregnancy-related empowerment and pregnant women’s self-care questionnaires before, immediately after, and three weeks after the intervention. Data were analyzed by using SPSS-24. Results: The results showed that the intervention increased the mean total score of empowerment before, immediately after, and three weeks after the intervention in both groups, however, the effect was more sustained in the intervention compared to the control group (P < 0.001). The results also showed that the intervention increased the mean total score of self-care before, immediately after, and three weeks after the intervention in both groups, however the effect was more sustained in the intervention compared to the control group (P < 0.001). Conclusions: Midwife-oriented group counseling affected pregnant women’s empowerment and self-care. Furthermore, the importance of maternal health and midwives’ role as health counselors suggests the need for a greater attention to this issue. Maternal mortality, due to pregnancy and childbirth complications, is a sensitive indicator of women’s status in the society and their access to care, the adequacy and quality of the care received, the capacity of the service providing system in responding to women’s needs as a community, and the socioeconomic status of the society (1). The latest WHO statistics suggest that almost 1000 women die every day due to pregnancy and childbirth, and 90% of such cases happen in developing countries (2). Maternal health promotion requires the provision of effective services to all pregnant women, such that the efficacy of the interventions are proven for families in terms of the time of provision, repeatability and acceptability, and have major benefits against possible pregnancy risks. furthermore, giving birth to a healthy child with no risk for the mother is the ultimate goal of prenatal care (3, 4), however, the evidence for the effectiveness of prenatal care remains equivocal, despite its widespread use (1-4), thus, it needs to empower the mothers for caring themselves (1-4). The concept of empowerment in medical sciences is currently focused on personal responsibility and personal ability to maintain health. One of the goals of the WHO is to emphasize personal, family, and community’s empowerment to promote maternal and neonatal health. Half of the world’s population consists of women, and their health ensures the health of children and families (5). Prenatal empowerment is defined as improved inner energy for pregnancy, successful childbirth, as well as better adaptation to physical and psychological changes during pregnancy and childbirth. In other words, it is a process by which people exert greater control over their decision-making, lifestyle, and activities that affect their health (6-8). One of the concepts in the empowerment of pregnant women is to increase women’s awareness in regards to self-care (9). The promotion of health through self-care is synonymous with the empowerment of people in a way as to have control over the factors affecting their health (10). Self-care focuses on the aspects controlled by the individual. For a good self-care, the individual must have motivation for performing self-care behaviors, knowledge, skill, and belief in the performance of that behavior (11). Orem’s model is one of the many counseling models available (12). According to Orem’s theory, as a regulatory function, self-care is different from other human regulatory functions, such as neuroendocrine regulation, due to the fact that it needs to be learned as well as be informed and compatible with the individual’s needs. In other words, it is a conscious action performed by the individual with several aims (5). Self-care behavior can happen in all aspects of health, it is not specific to a particular aspect or to the time before or after an illness (13). The results of some studies in Iran showed that the women’s empowerment in reproductive health was at an intermediate level (7, 10, 13), more attention needs to paid to this subject. According to the WHO, 85% of the care services provided to women around the world involve midwives. Women have a close relationship with midwives during pregnancy and childbirth (14). According to the WHO definition, the midwifery profession has a particular authenticity and offers efficacious and cost-effective services. A midwife guides the process of pregnancy, labor, and childbirth as a fully natural process and is at the same time responsible for risk assessment and detection of problems (15). Measures should therefore be taken to change midwives’ mindsets from merely providing information to pregnant women and offering them prenatal counseling for the purpose of empowerment for a healthy pregnancy, thus, reducing maternal deaths and moving toward a safe maternity. This study was therefore conducted to investigate the effect of midwife-oriented group counseling based on Orem’s model on empowerment and self-care in primiparous women. The present parallel randomized controlled trial was conducted on 74 eligible pregnant women presenting to select health centers in Talesh, Iran, in 2017. In accordance with the equation for calculating the difference between two means based on similar studies (7) and taking into account a standard deviation of 7.4 for self-care empowerment and a measured difference of five points, the sample size was determined as 34 per group that with a 20% drop, which determined 40 people in each group. The participants were selected from primiparous pregnant women presenting to health centers 1, 2, and 3 in Talesh. The study inclusion criteria consisted of (1) Iranian nationality; (2) minimum reading and writing literacy; (3) no specific physical-psychological problems during pregnancy; (4) willingness to take part; and (5) attending the counseling sessions. The exclusion criteria consisted of (1) withdrawal from the study; (2) failure to attend at least two of the counseling sessions; (3) failure to complete the questionnaires or returning incomplete ones. Data were collected using pregnant women’s empowerment and self-care (health) questionnaires as well as a personal-demographic checklist in a self-report manner. 1- Pregnant women’s empowerment questionnaire was a standard scale with 27 items in five dimensions: (1) self-efficacy (six items); (2) perceptions of the future (six items); (3) self-esteem (seven items); (4) other people’s understanding and support (four items); and (5) the joy of a new addition to the family (four items). Scoring is based on four Likert scale scores and one to four scores including: highly disagree (1), opposition (2), agree (3), very Agree (4). The validity and reliability of this questionnaire were confirmed in Iran by Jahdi et al. who reported a Cronbach’s alpha of 0.84 (7). 2- The self-care (health) questionnaire contained 96 items in five dimensions: the physical dimension of health (1 - 11 items, total score = 44), spiritual dimension (1 - 23 items, total score = 92), behavioral assessment (1 - 18 items, total score = 72), communication health (1 - 21 items, total score = 84), and social health (1 - 23 items, total score = 92). This questionnaire was designed and psychometrically assessed by Farajzadegan and was published as a book by Iran’s Ministry of Health (16). In this study its reliability was confirmed with Cronbach’s alpha of 0.81. - Session one: Introduction of the group leader as well as members to each other and creating a positive rapport, explaining the group rules, creating motivation for active punctual participation in the sessions, statement of the objectives, explaining safe pregnancy, as well as discussing the subjects’ feelings about pregnancy and understanding their perception of the effect of pregnancy on the body. - Session two: Counseling on concepts related to health and well-being, understanding basic information and familiarization with the subjects’ notion of empowerment (self-efficacy and other people’s understanding and support), their perception of the changes during pregnancy, and the content and framework of self-care in this period. - Session three: Understanding basic information and familiarization with the stages of fetal development, the subjects’ perception of the addition of a new member to the family, understanding and familiarization with possible pregnancy problems and the means of dealing with them as well as the necessity of self-care, reinforcing a sense of self-worth, and the subjects’ self-conception. - Session four: Counseling regarding the concepts, including self-efficacy and the content and framework of self-care and the subjects’ capacity to engage in self-care, demand for self-care and underlying factors, understanding concepts related to communication skills, and understanding the effect of family and social support. - Session five: Counseling and understanding basic information regarding healthy behaviors and prenatal self-care empowerment and its effect on the mother and fetus and understanding the effect of support from the spouse, family, and society on these behaviors, as well as introduction to prenatal health and screening services. - Session six: Summarizing the topics presented, practicing the skills learned through counseling, answering questions, and getting feedback in regards to the sessions held. The groups completed the pregnancy-related empowerment and self-care questionnaires before, immediately after, and three weeks after the intervention of the sessions. The researcher followed up with the patients over the phone during the sampling stage. A total of 80 women entered the study, however, six of them were later excluded, including three from the intervention group (two for failure to complete the questionnaires and one for miscarriage at gestational week 17) and three from the control group (two for unwillingness to take part in the sessions and one for failure to complete the questionnaires), ultimately the study ended with 74 participants (Figure 1). The data collected were analyzed in SPSS-24 using the independent t-test, Mann-Whitney U test, paired t-test and the repeated measures ANOVA. The data from 80 primiparous pregnant women, who remained in the study until the end, were analyzed. At first we assessed the normality of the variables using the Kolmogorov-Smirnov test then compared the variables in both group by independent t-test and χ2. The results showed no significant differences between the two groups in terms of mother’s age, spouse’s age, mother and spouse’s education, family income, and mother and spouse’s occupation; the two groups were matching in terms of these variables (Table 1). aValues are expressed as F (%). According to the results there were no significant differences between the two groups before the intervention in the total score of self-care (P = 0.267), which shows the homogeneity of the groups in terms of self-care status, however, after intervention there were differences and the mean score of self-care in the intervention group increased more than the control group (Table 2). The comparison of the mean scores between the two groups before, immediately after, and three weeks after the intervention showed a greater increase in overall empowerment in the intervention compared to the control group (P < 0.001) (Table 2). According to the results, all the dimensions of empowerment had improved in the intervention group immediately after and three weeks after the intervention compared to before. Comparing the effect of the intervention on the mean total score of empowerment between the groups before, immediately after, and three weeks after the intervention showed an increasing trend, although the intervention had a more sustained effect on this mean score in the intervention compared to the control group, which suggests the effect of counseling in the intervention group (Table 3). bP value for all data was < 0.001. All the dimensions of self-care improved in the intervention group immediately after and three weeks after the intervention compared to before. 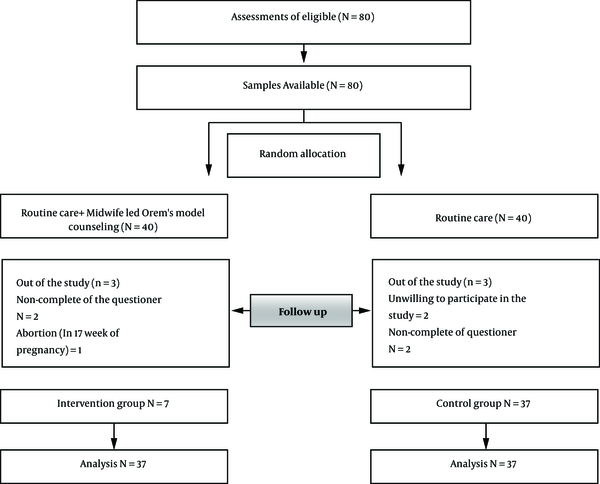 In addition, the comparison of the effect of the intervention on the mean score of self-care between the groups before, immediately after, and three weeks after the intervention showed an increasing trend, although the intervention had a more sustained effect in the intervention compared to the control group (P < 0.001), which suggests the role of counselors (Table 4). One of the challenges for maternal and neonatal health professionals is the access of pregnant women to the right information and prenatal support with the aim of affecting positive changes in their behavior, which can effectively improve pregnancy outcomes and empower women in terms of self-care and the use of sources of support (6). Reviewing the personal-demographic details of the pregnant women revealed no significant differences between the two groups; that is, they were matching in terms of these variables and these variables did not affect the results. According to the findings, the two groups had no significant differences in terms of self-care score before the intervention and were matching in this respect; however, immediately and three weeks after the intervention, the mean total score of self-care was higher in the intervention compared to the control group; in other words, structured counseling has a greater effect than routine counseling plus the educational package on self-care. This effect persisted longer in the intervention compared to the control group. Several studies have investigated the effect of interventions on the self-care score of pregnant women and their results have been consistent with the present findings in many cases. For instance, Ekhtiari et al. and Azadbakht et al. found that counseling based on educational models with a health promotion approach makes interventions effective and can lead to healthy behaviors by ascertaining belief-related factors that affect behavior. They also found a significant relationship between personal-demographic factors and the dimensions of self-care (17, 18). This result supports the present findings, due to the fact that the two groups in the present study were also matching in terms of these variables. Zhianian et al. reported that using self-care theory-based interventions is highly effective in promoting self-care behaviors in pregnant women (19), and the incidence of undesirable pregnancy outcomes, such as gestational diabetes, can be prevented by improving women’s awareness about and education in self-care and encouraging better lifestyles during pregnancy (20). According to the results, there were significant differences between the two groups in terms of the total score of empowerment before, immediately after, and three weeks after the intervention, except that the difference between the two groups in the mean score of empowerment was significantly higher immediately after and three weeks after the intervention compared to before. Furthermore, comparing the means in the two groups shows that the mean score of empowerment was higher in the intervention compared to the control group immediately after and three weeks after intervention. The effect of the intervention persisted longer in the intervention group and suggests the greater long-term sustainability of counseling. The present findings agree with the results of studies such as ones by Jahdi et al. and Baldwin who found that group care affects pregnant women’s responsibility, thus, carrying out similar interventions to involve women in self-care are effective. Moreover, the group that received group care had a greater pregnancy knowledge than the routine care group (7). Baldwin found no significant differences between their two study groups in terms of the dimensions of empowerment, social support, and women’s participation; however, in the present study, all the dimensions of empowerment, such as other people’s understanding and support, were better in the intervention group (which received counseling); yet, this finding disagrees with Baldwin’s results. The difference between these two studies seems to be due to the differences in study type, the low sample size, the type of care chosen by the women, and the cultural differences between the two countries. In Iran, people tend to have stronger emotional ties and receive greater family support. Since the studied empowerment program consists of a novel approach to pregnancy care, the evaluation of the quality of care in this program is essential (21). Ickovics et al. reported that pregnancy information, readiness for labor and childbirth, as well as satisfaction with care are greater in women who have received group care rather than other types of care. Thus, this type of care generally provides better psychosocial outcomes compared to traditional care, and this finding concurs with the present findings (22). According to previous studies, the presence of a counselor not abandoning the mother after the counseling session, being available for further counseling services if needed, as well as the content of counseling are the main factors for the sustainable and long-term effectiveness of counseling (6, 23). The lack of direct control over the proper implementation of assignments outside the counseling sessions was one of the main limitations of this study, even though the researcher followed up with the patients on the phone to ensure their compliance. Improved prenatal empowerment and self-care enables mothers from experiencing fewer complications in this period of their life. Thus, pregnancy provides a good opportunity for educating and counseling pregnant women to promote maternal and neonatal health and reduce the burden of medical costs in the society. The present study is the result of an MSc thesis in midwifery counseling. Hereby, we wish to express our gratitude to the research deputy of Alborz University of Medical Sciences for funding this project as well as all the midwives working in centers 1, 2, and 3 of Talesh, Iran. In addition, we truly appreciate all participating pregnant women. Ethical Considerations: The present study was approved by the Ethics Committee of Alborz University of Medical Sciences on March 4, 2017, under the code Abzums.Rec.1395.145, and registered at the Iranian Registry of Clinical Trials under the code IRCT2017021627728N4. 1. Pacagnella RC, Cecatti JG, Parpinelli MA, Sousa MH, Haddad SM, Costa ML, et al. Delays in receiving obstetric care and poor maternal outcomes: Results from a national multicentre cross-sectional study. BMC Pregnancy Childbirth. 2014;14:159. doi: 10.1186/1471-2393-14-159. [PubMed: 24886330]. [PubMed Central: PMC4016777]. 2. Munthe C. A new ethical landscape of prenatal testing: individualizing choice to serve autonomy and promote public health: A radical proposal. Bioethics. 2015;29(1):36-45. doi: 10.1111/bioe.12126. [PubMed: 25521972]. 3. World Health Organization. What is the effectiveness of antenatal care?:(Supplement). 2005. Available from: http://www.euro.who.int/__data/assets/pdf_file/0005/74660/E87997.pdf. 4. Appleton AA, Murphy MA, Koestler DC, Lesseur C, Paquette AG, Padbury JF, et al. Prenatal programming of infant neurobehaviour in a healthy population. Paediatr Perinat Epidemiol. 2016;30(4):367-75. doi: 10.1111/ppe.12294. [PubMed: 27004434]. [PubMed Central: PMC5054721]. 5. Prata N, Tavrow P, Upadhyay U. Women's empowerment related to pregnancy and childbirth: Introduction to special issue. BMC Pregnancy Childbirth. 2017;17(Suppl 2):352. doi: 10.1186/s12884-017-1490-6. [PubMed: 29143677]. [PubMed Central: PMC5688486]. 6. Borghei NS, Taghipour A, Roudsari RL, Keramat A. Development and validation of a new tool to measure Iranian pregnant women's empowerment. East Mediterr Health J. 2016;21(12):897-905. [PubMed: 26996363]. 7. Jahdi F, Montazeri A, Balouchi M, Behboodi MZ. [The impact of group prenatal care on pregnant women empowerment]. Payesh. 2014;13(2):229-34. Persian. 8. Veillard J, Champagne F, Klazinga N, Kazandjian V, Arah OA, Guisset AL. A performance assessment framework for hospitals: The WHO regional office for Europe PATH project. Int J Qual Health Care. 2005;17(6):487-96. doi: 10.1093/intqhc/mzi072. [PubMed: 16155049]. 9. Rahman S, Salameh K, Bener A, El Ansari W. Socioeconomic associations of improved maternal, neonatal, and perinatal survival in Qatar. Int J Womens Health. 2010;2:311-8. doi: 10.2147/IJWH.S12426. [PubMed: 21151678]. [PubMed Central: PMC2990900]. 10. Hatami H, Razavi S, Eftekhar H, Majlesi F. [Comprehensive book of public health]. 2. Tehran: Arjemand Publications; 2007. p. 45-7. Persian. 11. Naji A, Naroie S, Abdeyazdan G, Dadkani E. [Effect of applying self-care orem model on quality of life in the patient under hemodialysis]. Zahedan J Res Med Sci. 2012;14(1):8-12. Persian. 12. Dodd MJ, Dibble SL. Predictors of self-care: A test of Orem's model. Oncol Nurs Forum. 1993;20(6):895-901. [PubMed: 8367343]. 13. Eftekhar H, Mirkamali SK, Tavafian SS, Mohammad K, Shahnazi H, Sharifirad G. Exploring self care in Tehran, Iran: A population based study. J Res Med Sci. 2012;17(12):1144-9. [PubMed: 23853632]. [PubMed Central: PMC3703166]. 14. Abbaszadeh F, Baghery A, Mehran N. [Quality of life among pregnant women]. Hayat. 2009;15(1):41-8. Persian. 15. Shishehgar S, Dolatian M, Bakhtiari M, Majd HA. [A survey of relationship between social support with quality of life as well as stress among pregnant women referred to Shahryar hospital affiliated to social security organization in 1391]. Adv Nurs Midwifery. 2014;23(81):27-32. Persian. doi: 10.22037/anm.v23i81.5820. 16. Farajzadegan Z. [Training Self Care in youth & young]. Iran's Ministry of Health; 2015. Persian. 17. Ekhtiari YS, Majlessi F, Foroushani AR. [Measurement of the constructs of health belief model related to self-care during pregnancy in women referred to South Tehran health network]. Community Health. 2016;2(1):9-18. Persian. 18. Azadbakht M, Garmaroodi G, Taheri Tanjani P, Sahaf R, Shojaeizade D, Gheisvandi E. Health promoting self-care behaviors and its related factors in elderly: Application of health belief model. J Educ Community Health. 2014;1(2):20-9. doi: 10.20286/jech-010220. 19. Zhianian A, Zareban I, Ansari-Moghaddam A, Rahimi SF. Improving self-care behaviours in pregnant women in Zahedan: Applying self-efficacy theory. Caspian J Health Res. 2015;1(1):18-26. doi: 10.18869/acadpub.cjhr.1.1.18. 20. Momeni Javid F, Simbar M, Dolatian M, Alavi Majd H. [Comparison of pregnancy self-care, perceived social support and perceived stress of women with gestational diabetes and healthy pregnant women]. Iran J Endocrinol Metab. 2014;16(3):156-64. Persian. 21. Baldwin KA. Comparison of selected outcomes of CenteringPregnancy versus traditional prenatal care. J Midwifery Womens Health. 2006;51(4):266-72. doi: 10.1016/j.jmwh.2005.11.011. [PubMed: 16814221]. 22. Ickovics JR, Kershaw TS, Westdahl C, Magriples U, Massey Z, Reynolds H, et al. Group prenatal care and perinatal outcomes: a randomized controlled trial. Obstet Gynecol. 2007;110(2 Pt 1):330-9. doi: 10.1097/01.AOG.0000275284.24298.23. [PubMed: 17666608]. [PubMed Central: PMC2276878]. 23. Haji Pour L, Hosseini Tabaghdehi M, Taghi Zoghi Z, Behzadi Z. [Empowerment of pregnant women]. J Holist Nurs Midwifery. 2016;26(3). Persian.